Hello Everyone! 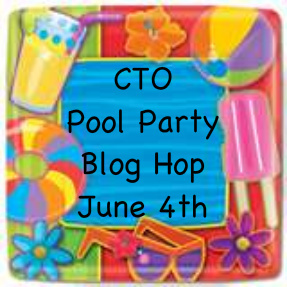 It's summer time here and we are Celebrating the Occasion with a Pool Party Blog Hop! My CTO friends and I have some amazing projects to inspire your Pool Party crafts and there is BLOG CANDY to be won at every stop! If you are hopping today, you should have arrived here from Nicole's blog Nadia's World. If you just happen to be stopping by to see me (thanks, that makes me feel special) you'll want to start at the Celebrate the Occasion Challenge Blog and see all the fun Pool Party projects! Lately, I feel like I've been neglecting my scrapbooks so I figured I would make a Pool Party themed layout for you today! I have been wanting to scrapbook these pics of my Oldest E for the longest time. This was 2 years ago when she was three and she was having a pool party (by herself)!! It was one of those priceless moments caught on camera! I'll apologize now for the terrible pics! Baby E is getting another tooth and she is has been screaming at me all day! I took these pics with her on my hip and most are uneven. Also, she has sabotaged my camera again and now there is a black spot on every pic! Sorry! OK, no more chatty, on with the layout! I used Bo Bunny paper for my LO. I've been hoarding this collection since last year and it was screaming out to be used! The title is cut from American Alphabet and the postage stamp cut on the bottom right is from B is for Boy. I hand cut the flags because I was using up the tiniest scraps of my Double Dot! I was thrilled when the mail came Friday with my new Baker's Twine! Don't you just love the bright colors! It is a Twinery collection and it is the newest product over at My Craft Spot! Speaking of My Craft Spot, would you like to know who my sponsor is for the Hop today??? You guessed it...It's Kimberly from My Craft Spot! Kimberly has given me an extra set of this bright and summery colored Baker's Twine to give away to one lucky winner! Thank you Kimberly!! You must leave me a comment telling me what your favorite part of summer is! You do not have to be a follower but if you like what you see today, you are welcome to become one! If you are one of my followers, you may leave a second comment letting me know that you are (because I truly appreciate all your encouragement and support)!! After the hop, make sure you stop by and check out all of the great product and inspiration at My Craft Spot! I will draw a lucky winner on Tuesday afternoon so make sure you stop back to see if you won! OK, I've taken enough of your time today! Your next stop on this Pool Party Blog Hop is one of my Best Bloggie Friends, Rayna at Purple Peep Techniques!﻿ If you are hopping and have lost your way, you can go back to Celebrate the Occasion to find the line-up! We Celebrate the Occasion every Tuesday, so please stop by and join us! I've been missing out on some fun challenges so I thought I would make this LO with a few in mind! Thanks for the inspiration! I hope some of you can find the time to hop along too! There is really great blog candy at every stop! I just hopped and it is really good stuff too : )!! Very nice L/O, looks like they had fun! Great double layout, love those papers they are the perfect match. Thanks for the chance to win. WOW! LOVE LOVE LOVE it. The details are incredible. I first saw this this morning as I was hopping through the blog hop. Then again for the Getting Cricky challenge! And, of course I am already a follower of yours! Awesome LO! Such pretty papers!! This is a GREAT LO! Your daughter is too cute! Oh yeah... my favorite part of the summer..swimming and fishing and camping...anything outdoors with my family! I am a new follower! Wonderful blog and I can't wait to come back and check it out!! My favorite part of the some is being able to sit on my deck in the evenings high on my hill top and look at all the wonderful colors down below and across the mtns in the distance. I so love you layout pages great job. Such an awesome LO!!! Perfect for the HOP! I love all the details!! TFS!! Your LO is so fun and cheerful -- great job! I love all the detail on your layout! Beautifully done, Great job! I love the pool during the summer. Great give-away! Darling layout Amber, the paper is perfect with your pictures and your banner looks great!!! 1st - I love the layout and everything about it. Great colors! 2nd - What I love about summer, spending the day at the pool with the kids. WOW WOW WOW! This is such an awesome layout! I love all the details and you did that paper justice! It turned out fantastic! Thanks for playing at WHimsical Wednesdays! I just became a follower, we must have good taste in blog names! Love your blog. Please stop over and check out my blog. Very cute layout, love the darling pics!!!! My favorite part of summer is waterskiing with my family! A total feast for the eyes. So many gorgeous details. Love it! i love the weather in summer!! i like it hot! So stinkin' cute!! I love seeing the pictures of your girls! My little monsters would stay in the pool all day every day if I would let them! Glad you added the banner for Getting Cricky *wink*. You did a wonderful job on your layout. Wonderful layout!! Love all of the detail!!! What a cute layout girl... I love to see your adorable girls..
Not here for a chance to win, just wanted to comment. Such a cute layout! Love the bright colors and the cute banner! Super cute and fun layout. Im a follower of yours. Hope to see more layouts. My favorite part of summer is camping with my family. Great LO. Im a new follower. What a cute layout!! Thanks for sharing! what a gret blog. i have never been here before. love your style and creativity. the summer pool layout is awesome! you sure capture the attitude and personalities of your kids. What a great LO! Fun in the sun!! No better way to spend the day! My favorite part of summer is hanging out at the pool, sipping on a beverage and enjoying the hot sun! I am a follower of yours already and always love visiting you. You have a lot of fun projects and I get inspired each time:) Thanks!! I'm a follower already!! I love your blog! SUPER CUTE layout! My favorite part of summer is hanging out by the pool! Beautiful LO I love everything about it. The details are just amazing. What an adorable layout! Thanks for a chance to win your blog candy.--Pat N.
I just became a new follower.--Pat N.
Amber, great layout. My favorite part of summer is vacation time WOOT WOOT! I'd have to say my favorite part of summer is when it's over! I don't like heat too much. So cute and so much fun!!! Thanks for joining the Getting Cricky Challenge. Your LO is amazing! I love it, all of the colors and work put into it! i want to become a follower, but for some reason it won't show me the follower section, but I'll be back to sign up when it shows it to me again! Thank you soooo much for the inspiration, like I said amazing work! oh forgot to tell you my fav part of summer..that would have to be bbq and swimming. Your page is beautiful not only because the kit is beautiful but because you used it well. My favorite part of summer is the 50th state fair! :) I eat and eat until I can't eat anymore! Thanks for the chance to win! Love this layout! I have trouble taking pics all the time too. It always looks good on my camera screen but once I get on computer its blurry! Maybe my eyes are just bad!! Thanks for sharing! Love the twine! New follower here! I also follow the craft spot too! great job on the LO. LOs are my favorite when i;m blog hopping! What a cute layout...and your girls are adorable!! i am soo loving this two page layout!! OMGosh.. love it!! soo colorful!! I absolutely adore your layout. You little E looks like she was having a Diva good time!!! I love the twine you use. It always adds so much special charm to your projects. Thanks for becoming a follower and it would be fair to whoever follows along at my blog candy giveaway to win! Even if you are only a new follower! That's the point....to make someone's day, not pick favorites! LOL! I am going to try to do the entire hop in just a few minutes, but wanted to at least get a comment back to you!!! Thanks again!!! I happened upon your blog because of this hop. You are amazing! I am a new follower! Oh yea, my favorite part of summer is going to the beach! I am a new follower. I just came across your blog. You have some of the cutest pages and cards. Thank you so much for sharing, this is also my first hop so hope I'm doing it right. Your layout is AWESOME I love it. Thanks for sharing. My fav part of summer is the fun sales and going to the lake with my boys. I love the colors on this layout. It's so detailed! Thanks for sharing and for the chance to win! My favorite part of summer is all the fresh fruit and vegies. Thank you for sharing your neat layout. AwesomeLO. Love the detail and papers! Great memories. TFS joy4umetoo at hotmail dot com (follower) Fav part of summer; sleepin in if we want and vacations! This LO is so FUN!!! The colors are so bright and all that detail! I would have been jumping for joy if I had found some twine in my mailbox this morning too :) I have wanted some for a very long time but just haven't broken down yet. How fun would it be to win some. I think my favorite part of your layout is how you used so many fun colors and that you put them on kraft paper to make it all pop! TFS and joining us at Getting Cricky this week too! What fun layout you made. I feel the same way, I feel Like I have neglected scrapbooking and need to get back into it. My favorite part of Summer is that it will be time to celebrate my birthday this month. New follower. What a great layout. You put alot of details in this making it really special. Love the banner and the button. Thanks for sharing. I am in desparate need of some bakers twine! I am a new follower as of today. Hope that counts for a second entry. Amber, this is absolutely AWESOME! You put sooo much detail into this amazing layout; I love love love the twine on the pennant/banner! GORGEOUS!!! Amber, if I could make LOs like this, I would do it all the time. This is perfect…pennants, buttons, tags, sun, twine, bling, and bathing beauties! My favorite summer activity is sitting on the porch with a good book and looking out over the ocean at the beach. My faourite part of summer is definitely the sun! Love the heat after winter. Amber your LO is amazing as always! I love all your little details and accents and that baker's twine is awesome! I love the color combo too, so summery and fun! Like the theme. Fav part of Summer is swimming in our pool. Like chance to win. Like the twine. don't you love those little banners? and the colors are great! Great layout! Love all of the bright colors! Love the colors you chose for the pool party layout. Super fun!! And I've been a follower woot woot! What a cute layout and I love the party for one! LOL. ARen't they fun. My favorite part of summer is simply the warmth. We have snow and cold and blowing way to often. I love it warm and no wind! LOL. Thanks! Oh Amber, I alway look forward to seeing your amazing layouts and this one is absolutely FABULOUS!! I love your title and your banner adds a perfect touch to you page.. I'm so glad that you could join my "Getting Scrappy Challenge" and I hope you will join in again this Sunday ..
Super cute layout and great giveaway! Great layout. I love the double page. You did a great job capturing all the fun in the pictures and on the page. TFS. Super CUTE summer pages! I like sunshine, it's my fave part of summer. I added myself as a follower to your blog, thanks! Your layouts turned out INCREDIBLE! I love the banner, how you split the picture between both pages and the tag, sota likea mathe equation with words! Super fun Lo's and she looks like she had a wonderful time! Thank You for playing along with us at Whimsical Wednesday's! What a fantastic take on our summer theme challenge over at Whimsical Wednesday.. I am a new follwer, but only because I think your creativity is awesome!! Great LO...it's definitely a party!